Out of My Great Sorrows is the story of Philadelphia artist Mary Zakarian, whose life and work were shaped by the experiences of her mother, a survivor of the 1915 Armenian Genocide. Written by Mary Zakarian's niece and nephew, the narrative examines the complexities of the artist's life as they relate to many issues, including ethnicity, gender, immigration, and assimilation. Above all this is a story of trauma - its effects on the survivor, its transmission through the generations, and its role in the artistic experience. Zakarian painted obsessively throughout her life. As she gained recognition for her artwork, she became increasingly haunted by her mother's untold story and was driven to express the tragedy of the Armenian Genocide in her art. Zakarian's attempt to deal openly with the issues of trauma and guilt caused conflicts in her relationship with her mother. These emotions became a driving force behind her art as well as the basis for her personal difficulties. By examining Mary Zakarian's life and art, the authors bring new insights to the study of the Armenian experience. This moving story will inspire all those who have struggled to express themselves in the face of injustice and oppression. "Armenian and female, Mary Zakarian's quest for identity, community and clarity was through her art. Out of My Great Sorrows explores the odds against Zakarian as a woman artist, while noting her personal journey as the daughter of Armenian genocide survivors. The heartbreak and pyschological scars of her refugee family belonged to Zakarian too, while her art provided a vehicle for escape. In their poignant, trenchant, and memorable study, the authors show us how gender, race, self-expression, and a veil of sadness all contributed to Mary Zakarian's distinctive work." Debut authors Allan and Susan Arpajian, the children of Zakarian's sister, know the subject well and depict her candidly and lovingly-some of their portrait based on personal recollections and some on Zakarian's journals and an unfinished autobiography.....While Zakarian's extraordinary life, and particularly her attempt to transcend her trauma through her art, is the fulcrum of the story, the authors also ably reconstruct the history of Armenian tribulations and the resulting psychological scars. The Arpajians provide an impressively sensitive account of Zakarian's Christianity, which was fraught with contradiction. 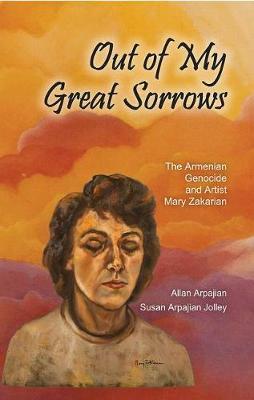 "Mary Zakarian's "great sorrows" reveal the trauma of genocide transmitted imperceptibly across generations and its impact on the creative talent and production of an anguished Armenian American artist." "A brilliantly-crafted scholarly work, well-researched and inspiring." "This inspiring book is, at the least, a crucial piece of the growing literature about Armenian-American life. But it's also a chronicle of growing up in the second generation, and, as such, should resonate with a wider audience. It's not a stretch to think this book should be transformed into a one-woman play or some other drama. It is compelling reading and time well-spent for anyone interested in woman's studies, the art world, and the Armenian-American community."